Step Away From the Cake: Just a quickie before I head off to work. Just a quickie before I head off to work. I slept in this morning. I slept until 6:45 which, if you have birds you know, is LATE!!! When I finally got up and moving it was getting late but it was such a gorgeous morning I could not miss my bike ride. So I hustled through my chores and headed out. It was one of those postcard mornings. Brilliant blue sky, white fluffy clouds, the ocean was calm and crystal clear. You know in the hectic day to day I sometimes forget how lucky I am to live in Hawaii. Well, today was one of those days that helped me remember. Since I was a little tight on time I only did 13 miles (about an hour). I did get 1/2 way up the monster hill that's 5 miles from my house. 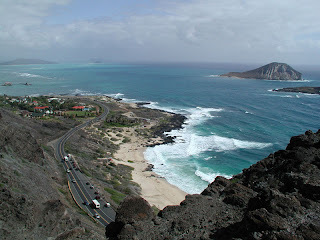 It the road that goes around the east side of the island and the hill is monstrous. This picture shows the road. It's a steady climb from sea level up. This picture only shows a small part of the road. It continues up and around the mountain for a few miles. So I made it about 1/2 way up what you can see of this monster before I ran out of time and energy. Luckily the ride down is a lot faster :) Kind of scary actually. Anyway, that was my morning. I'm off to work for a few hours and then it's some housework - yuck!! !